Question: "What is Justification? How can I be Justified ? Justification means to be “declared righteous,” it is God pronouncing the sinner right with Himself. Through Justification God pronounces you a righteous man, and from that moment treats you as if you never committed any sin. Justification answers the question of how a perfect God can accept sinners into His presence. It is by Justification that God is able to punish the sin and accept the sinner. Job asked the question “How can a man be right before God” (Job 9:2), Justification answers this question. Justification is a courtroom term, and when a sinner is justified the hammer comes down in the court of heaven and from that moment the sinner is declared righteous. A justified person can say they are as good as God, because the righteousness imputed to them is the righteousness of God. In a classroom a teacher asked the students to put their hands up if they were as righteous as the person next to them, a few students raised their hands. Then he asked them to put their hands up if they were as righteous as Billy Graham. Less students put their hands up. Lastly he said, please put your hand up if you are as righteous as Jesus Christ. Just one kid put his hand up. The teacher said if you have trusted the person and work of Christ you can confidently put your hand up and say you are as righteous as Jesus Christ. You are now as good as God. Why? Because Christ became something He was not (He was NOT sin but HE became sin), that you would become something you are not, (you are NOT righteous but that you would become righteous). 2 Corinthians 5:21. Justification enables God to justly punish sin and at the same time pronounce the sinner righteous. He can be just and the justifier. In Christ sin is justly condemned, and so God can at the same time be just in declaring the sinner righteous. Justification is a positional truth and not a change in character, it is Christ’s work FOR us not His work IN us. Justification includes forgiveness but isn’t only forgiveness. We can’t say forgiveness equals justification because justification is much more. Justification isn’t just forgiveness but the removal of guilt itself. Guilt is removed from the sinner completely. Sin is removed as far as the east is from the west, and the east and the west never meet. Pardon just deals with past sins but justification deals with past, present, and future sins and therefore is more than pardon. At the cross 2000 years ago, all our sins were future, and at the cross all our sins were placed on Christ. Therefore we are not just pardoned from past sins but completely forgiven of all sins. 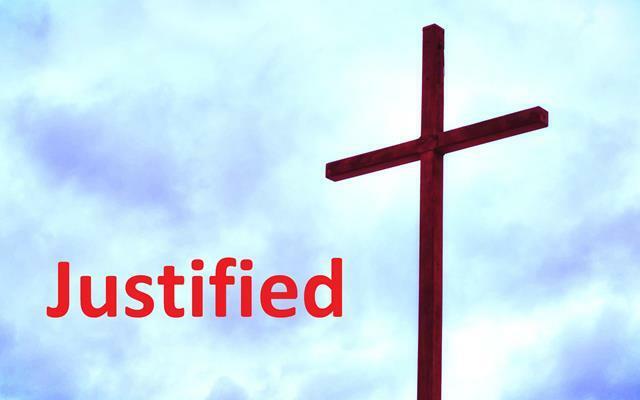 Justification happens the moment we put our trust in the finished work of Christ on the cross. We are then placed in Christ and declared as perfect as God. Justification is a change in position not a change in character, it is Christ’s work for us not in us. Justified people are still sinners. When we are justified we still have the same mind and nothing has changed in our character. Christian growth or progressive sanctification is the process of changing our character. A change in character is the process which happens after the moment we are justified. Justification is more than innocence as we are not just a blank slate at the moment of Justification but instead truly in a standing of positive righteousness. Justification does not just mean “just as if I never sinned” as this just implies innocence. At justification we aren’t just brought back to a state of innocence like Adam in the garden, but rather a positive righteousness, and this positive righteousness is the righteousness of God. A justified person can truthfully say they are as good as God. Justification happens fully the moment someone is saved. To argue justification is a process is to confuse initial salvation (justification) with Christian growth (sanctification). Someone can’t be more justified as they live the Christian life. Justification is a state of utter perfection imputed the moment someone trusts the person and work of Christ. Justification is by God’s grace freely. Justification is a complete free gift which requires no meritorious action. Not one person in heaven can say they deserve to be there. For Justification is by grace, and if by grace then there is no work involved. If by my works then I am the cause of justification but if not by works, but by grace then God is the cause. Romans 3:24 says we are “Justified freely by His Grace”. The word freely is the Greek word Dorean which means ‘without a cause’. There is no cause in us, and no spark of goodness why God would justify us. The cause is in Him alone. The same word ‘dorean’ is used in John 15 when referring to Jesus, they “hated Him without a cause”. Jesus had no sin in Him, and there was no reason why anyone should hate Him. There was no cause in Jesus why He was hated. Faith is the human response to the Gospel of grace. Faith is the only way man can access grace. Faith is not a work but in a different category than works, for faith is about trusting the work of another. Faith is the only acceptable response to grace, and because we are saved by grace the only acceptable response is faith, and saving faith is placed in Christ.